Space has captivated mankind for millennium. We have built monuments to the stars all across the world in Egypt, South America and England to try and understand what hangs above us. We are now in an age where our technological advances are propelling our knowledge of the universe faster than ever but every time a question is answered, a thousand more questions arise. It is the sense of wonder that I wanted to build upon for my competition proposal. The scale of my building is large. I wanted to provide a sense of awe in the architecture to prepare the occupants for the sense of awe when they learn about the universe. My inspirations were the neolithic structures of the long past, I intended for the building to carry a sense of ancient wonder, that it ha been lying in the desert for thousands of years but it still carried secrets about the stars. I have provided a building for people from all walks of life to come to and appreciate the night sky and what is beyond. On the top floor, accessed by a long ramp, people must pass by galleries of work and images from deep space. I want the galleries to be full of images that the naked eye cannot see from earth, images that will provide wonder again for people since when man first landed on the moon. Next, there are many classrooms and laboratories. The idea here is that both amateurs and professional scientists can work side by side and share knowledge. Finally on this floor is the large canteen/restaurant where the resident scientists eat and the visitors and people staying there. This will hopefully break down the barriers between high science and the everyday star gazer. On the floor below, accessed by a shorter ramp on the side of the building, is an immense indoor planetarium. Giant planets are squeezed into the atrium space by the ramp. Following on up the ramp is where the scientific equipment is stored and hotel rooms face out from the building. More hotel rooms are located in the circular building out from the main building. Here, visitors can spend the night in unique hotel rooms with roofs that have the ability to lift up on clear nights so the visitors can stare up at the stars from the comfort of their own beds. 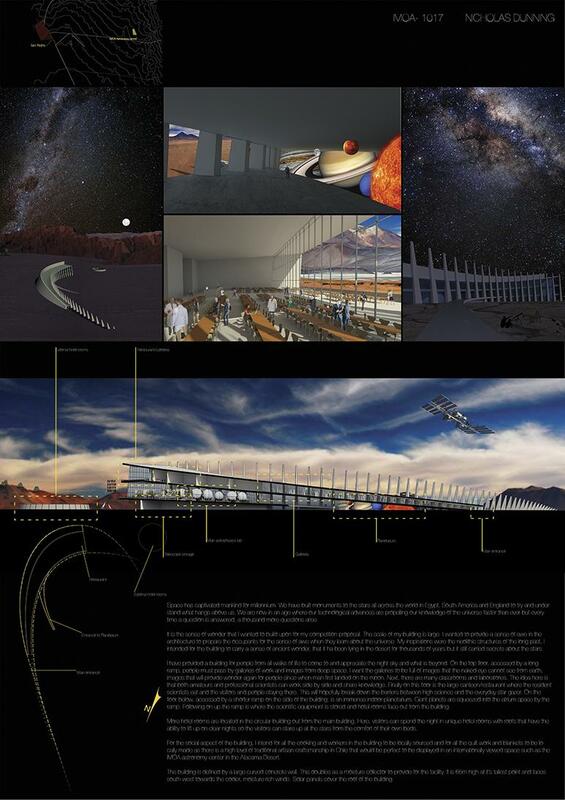 For the social aspect of the building, I intend for all the cooking and workers in the building to be locally sourced and for all the quilt work and blankets to be locally made as there is a high level of traditional artisan craftsmanship in Chile that would be perfect to be displayed in an internationally viewed space such as the IMOA astronomy center in the Atacama Desert. The building is defined by a large curved concrete wall. This doubles as a moisture collector to provide for the facility. It is 65m high at it’s tallest point and faces south-west towards the cooler, moisture rich winds. Solar panels cover the roof of the building.